I just have to rave about this soap! After reading about the soap at LMC Co's catalague and how it was scented similarly to Chinese wash and the Van Van products, I decided to give it a try. The label referred to using it not only for laundry but dishwashing as well as woodwork. I had opened the bar to get a smell and it is a wonderful citrus-y scent (we passed the bar around the family for whiffs it was so yummy). It really does open up pathways. Since I had a sink full of dishes to do (not a favorite task) I decided to give this old fashioned bar a try. Rather than grating some up, I just rubbed my wet dish sponge over the bar to lather it up. The soap was great! It powered through grimy caked on granola cereal bowls as well as greasy cutlery. The addition of the magic of the scents made the normally unpleasant mundane chore a joy as I watched my dishes rinse clean (and not needing a lot of rinsing either like modern detergents seem to need). I am looking forward to doing more housecleaning with this wonderful, purifying and way-opening soap. Which is something of a miracle since housework has always been something I've considered a burdensome chore. Add magic to your daily routine with this wonderful soap. Is it traditional to dispose of the used bathwater to a crossroads to, if one has been bathing with a spiritual soap like Florida Water soap, Pine tar soap, etc.? kevin9 wrote: Is it traditional to dispose of the used bathwater to a crossroads to, if one has been bathing with a spiritual soap like Florida Water soap, Pine tar soap, etc.? Well its traditional to dispose of the bath water if you have taken a spiritual bath. In other words a lot of people use soaps that are either brands frequently used in spiritual practices like Florida Water soap or soaps that are scented with scents that have specific applications in conjure practice--like lemon verbena. If you are using the soaps along with prayers, candles, and bath crystals or herbal teas for a spiritual bath either in preparation for spell work or for uncrossing/cleansing purposes then you would dispose of some of the bath water accordingly. If you bathe though on a daily basis with Florida Water soap you don't have to dispose of the water every time you bathe--does that make sense? Yes. Thanks. I just had never heard it mentioned when one was using a spiritual soap as opposed to an herb or mineral bath. The spiritual sopas are generally used in between more full-fledged rites of bathing or cleansing. You do not generally take bathwater to the crossroads or into the yard when simply "carrying the good work on" with a spiritual soap. So what is the difference between the spiritual soap and bath crystals is it a seneral or specific difference?When do you use spiritual soap as opposed to other? Sharona22 wrote: So what is the difference between the spiritual soap and bath crystals is it a seneral or specific difference?When do you use spiritual soap as opposed to other? Bath crystals are used in ritual bathing and are often a combination of salt, a condition oil or a blend of condition oils, and appropriate herbs. Spiritual soaps are soaps that have scents or are manufactured by companies that have spiritual products. Florida Water soap, for example has the same scent as Florida Water which many people use in their spiritual practice. Spiritual soaps can also just be regular soaps that have specific herbal scents, like lemon-grass which have a tradtional significance in conjure practice. Some people use spiritual soaps everyday as miss cat said, this can be a way of keeping the good work going. Typically people use bath crystals when they are taking a ritual bath and part of that ritual is the disposal of the bathwater before sunup. What are the spiritual properties of these soaps? I just ordered a Parrot Botanicals No. 333 Green Soap, Money Drawing and also a Money Drawing Oil. I'm waiting for the items to arrive. I just wanted to know has anyone else tried those items? The Money Drawing Oil is amazing. I've been using it for years, and it always comes through. Not always with actual cash money, but it will definately help you. I'm struggling financially at the moment, but I always manage to have anough to pay my bills. I used the oil in a bath, and shortly afterwards my best friend bought me a whole heap of vgetable plants for my garden. The syuff works! Money Drawing is wonderful. Seconding NotDorianGrey. You won't be rolling in cash but you will have just enough to get you by, and maybe even have a little extra left over. As for myself, I would not mind enough money that my husband and i will never have to worry again. We really deserve it. It is no fun struggling all the time. I'm tired of it. Good people should not have to go through that. I do know that is like that on purpose due to someone who does not want to let go and jeolousy. Voodoo. All the soaps listed on LM are thoroughly detailed in what they are for, I am curious to know what spiritual practical use the African Black Soap has? This is a traditional style of African soap, and is used as a beauty bar by African immigrants who like the style and by African Americans who appreciate its texture and quality. Lucky Mojo Cuio Co. carries a lot more of these traditional "pharmacy" type items for African American buyers, including hair care goods, skin creams, and other old-time products, in keeping with our mission to serve the hoodoo community. Ms Cat already answered this question in a previous (and very recent!) thread. I have been reading/researching all info here at LM on the different "soaps" they offer for different magical workings. I am interested in hearing about your personal experiences/results from using any of them. I use the Sandalwood soap (both Bee and Flower Sandalwood and Mysore Sandal brands) for a peaceful home and love it -- especially after i found out that it my husband's favourite scent -- 'cause if it keeps him happy, then that's good, you know? I used the Bee and Flower Rose (my favourite scent) for love baths for many years, and never lacked for lovers. I have used the Black and White soap for complexion and beauty -- it is a very bright pink (shocking colour!) but has a great texture and smoothness -- a real old fashioned beauty bar for sensitive skin. I used the Green Parrot soap for money drawing in the shop bathroom in 2009 and we had our best year ever in terms of sales. I recently ordered the Sandalwood soap and will try the others listed. I adore the Bee and Flower soaps and used them for years! They're fantastic! I recently received the Green Parrot soap; it's almost too pretty to use. Although the scent is described a clove and citronella, it is very subtle and doesn't leave a strong smell behind. On my next order I intend to pick up the Bee & Flower Jasmine and Sandalwood soaps. I am also very intrigued by the protective camphor-scented soaps, but don't want to distance myself from my familial spirits. I have heard that camphor can be antagonistic, even to benevolent spirits; does anyone have any firsthand experience regarding this? I've definitely been taught that camphor will keep away beneficial spirits of the dead, as well as the negative spirits. One practitioner mentioned that when he does use camphor due to a need for a deep cleansing, he will warn all his helper spirits so they can go away peacefully while it is being used and not be chased away by it. You might want to use a similar method. I'm trying to find soaps that would be good for spiritual cleansing but that don't contain animal fat. Octagon does and I'm wondering whether Fans' laundry soap does too. Also, does the Chinese Wash contain any animal fat? It's good to try products like this though! You might find that you like some of the traditional African products, no matter what your ethnicity. Many thanks to Ms Cat for making such a wide variety of delicious toiletry items available to so many different people. I have tried several and was pleased, specifically, the Bee and Flower Chinese Soaps. They last a long time. I love the Green Parrot soap. I can recommend the Bee and Flower Ginseng soap. I love that stuff. I love all the Bee and Flower soaps and used to use them all the time. I no longer use bar soaps, but if I did, I would use them for sure! Can I bathe with the black pullet egg soap before and after doing uncrossing work? I am getting all my goodies next week (woohoo!!) and I know that I have to bathe before and after but is this soap good enough on its own? i was also planning on either saging myself or using frankincense. Black Pullet soap is great for uncrossing work and is used not only in Hoodoo but also in Mexican folk magic practices. oh wonderful! then I'm good to go I just need my goodies. thank you Miss Bri!! Between spiritual soaps and spiritual washes is there one that holds more power than the other or theyre both about equal in that regard? Also after using a spiritual wash the idea is to get what you washed off of yourself away from your dwelling as far as you can hence going to the crossroads and not letting it go down your drain into the pipes of your home. My question is wont some of what you pouring over yourself have to go down your drain, beacuse you wouldnt be able to retrieve all of what you poured over yourself? With spiritual soaps and washes, unless you're using an old school wash tub to bathe in, stuff is going to go down the drain. That's fine. Just take an amount to the crossroad so that a portion of that energy is scattered. I take the time that the water is draining to visualize all the stuff being drained out of my life. Then I take the portion to the crossroads to seal the deal. I would favor washes over soaps, simply because your intent goes into every single step of preparation. Plus you can completely personalize the ingredients for your cause. When doing a spell or ritual, I would always recommend using a wash. However for day to day maintenance, soaps are great - just make sure to use them intentionally, and not just soap up with them like you would with a bar of Dial or something. Thanx for the review...Now i want to try this! Awesome. This is so going on my next order! 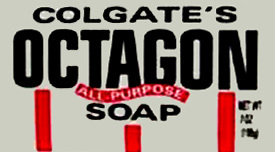 I haven't tried the Octagon soap, but I am very fond of the similar Fan Chinese Laundry soap. I use it for personal cleansing, household cleansing and mundane chores like laundry and every day housework. I often send a bar to my clients with instructions on how to use it for personal and household cleansing and they also report great results. I find these old-fashioned formulas have endured for very good reasons...they work! I bathe with the Octagon soap all the time. It's fantastic. Where I would have allergic reactions to other soaps, that doesn't happen with this one. What part of the day or night is best to use Spiritual Soaps when used daily? (Not Washes). I usually just use them whenever I happen to take my daily shower. I say a prayer of intent before scrubbing with them. When using spiritual soaps, I dont follow moon phases, times, or days, I just use them as Devi mentioned... They are like a followup or back up to the spell work. in my last order i had gotten one of these bars. i just have a question on its use. i was just wondering if some of the water from the bath/shower needs to be saved and tossed at the crossroads like other uncrossing baths? and i really like the scent of the soap too..anyone know what it is? i cant put my finger on it to say what exactly it is. I use the water to wash down my home but havent thrown to the crossroad. I just let it flow down the drain, its a spiritual soap, not a full on spiritual bath. How well does this soap work? Everyone says that I am light skinned but can I use it to make myself even lighter or do I have have to be a certain color for it too take effect? We are currently out of stock on this soap and unable to get more -- somebody really liked it and bought our last two dozen bars! Sorry! Oh my! Well I will take that as a sign that it works really well! Thank you, Devi. Indeed, I had seen some information regarding this on your blog, which I very much enjoy. While I do like to keep myself and my home cleansed and warded, I will probably continue to choose methods that won't displace my familiar/familial spirits. I have had good success employing a combination of benzoin and sandalwood for my more intense cleansings. I seldom smudge with sage, as it bothers my oldest daughter and have found the benzoin/sandalwood duo to be very pleasant and effective. It is good to know, if needed, how I might use the camphor without displeasing the ghostie members of my household. I have tried the Bee Flower Ginseng, Jasmine and Sandalwood soaps, while I love the scents, I am not too particular about the soap. I like the herbs better as I see results when using them compared to the soaps. I love the Fan Medicated Soap (Uncrossing), I just feel good afterwards. It is good to know about the 'running away good spirits' ...dont want to do that; I normally use it either before or after certain types of work with great results. I have tried the pullet egg (Huevo De Gallina Negra) soap with good results. Ive had the Florida Water Soap for some time now; I use Florida water often with good results, just hadn't the opportunity to use the soap. African Black Soap, simply because it's good for my skin, especially if it's allergy season and my skin is sensitive. Florida Water soap! Always. I take it when I travel to get rid of others' emotional detritus, to physically clean anything that has a bad vibe, when I'm cleaning others' homes, to get rid of that "sickly" feeling in the homes of the elderly, I rub up a lather and put it in mop water, wash water, use it in the bath, and hand wash anything that needs cleansing. I'm going to try that Parrot soap, though. It sounds great. I highly recommend any and all African Black Soap! Fantastic stuff for my finicky skin! There are separate threads on the more popular brands of soap that we carry (African Black Soap, Bee and Flower Brand, Octagon, etc. ), so be sure to search by name of the sop as well as asking questions in this more general soap thread! We can made no guarantees that any of the soaps contain no animal fat. Chinese Wash does not contain animal fat. You can buy a suitable Lucky Mojo herb mix, boil it up, and use it for bathing without soap or with your own soap. That would be a good idea! LOL! Was wondering if anyone with psoriasis has had a good experience with a particular LM soap? I'm looking to get something that cleans, physically and spiritually, and is also very moisturizing. I would assume that most of the soaps for black skin are, but wondering if one stands out.